Still rainy and the snow is now icy from melting. We waited so patiently for the snow to come and now that it has, it is going away like spring. What a strange winter we are having. Cars are driving by heading to their destinations. Our road is a main road so it is busy every morning starting at 4 am. I am thinking... That I should be sleeping… grr… I am sure my cold meds will kick in soon and I will be. We had a sad weekend as a teacher from my daughters school passed away last Thursday. I knew she would take it hard but I did not realize that the whole town would. It is amazing the impact he had on his students in his 28 years as a teacher. He nicknamed the children and made them all feel special. He was especially great with the children who were out of place or shy. There are so many memories posted of him online at his Facebook memorial page. I had talked to him once about computers and he said he was not that into being on the computer, so I do not think he had a personal face book page. While working at the bar I did not like working the nights and weekend crowd as it was always a bunch of sloppy, trouble making, drunks. Sorry I have been one of those too in my past but I preferred working in the afternoon. I liked working in the afternoon crowd as I liked hanging out with the older people that came in.The entire older crowd would come in and when Nic would get done with school he would pop in to play Keno. (He was not a drinker to clarify but had a bud light once in a while.) There were not many days that I worked there and did not see him. He played and his tickets had to be run every 2 minutes. One time I was busy and did not make it to run his ticket in the two minutes. He missed winning but since it was a somewhat smaller amount he was not that upset. I did sell him one where he had to collect it at the Michigan lotto but I do not remember the amount. I always routed for him to win. There were some things that bother me horribly about Nic passing away aside from the fact that I knew it would break my daughters heart. I really could not sleep the night I found out. First of all I wondered if he had been saved. I know that is a strange thought but it just makes me feel better to see those we care about were saved and they are in a better place. I did find out from reading his obituary that he graduated from a catholic school. Then I thought about how sad it was that he was always alone. He would go to school and be with the children, work the after school program then he would come play lotto and head to the store. That was his life. I had never heard that he had a wife or children of his own. ?once in a while he would have something that he was going to and would say he would not be in for a few days to play keno. He kept saying he wanted to win big and retire but I am not sure what he had planned for after retirement. If you read his memorial page you can see how many people he impacted. He taught not only academics to the children but he taught them to believe in themselves. He had a way with all the children but the ones that were shy, had speech impediments or were different from the majority were always made to feel that they mattered and could make a difference by him. The last and biggest thing that bothers me is it breaks my heart that he gave all that and I don’t think he knew how great he was. I doubt that he has a clue how many tears have been shed for him by so many. I am thankful... for everyone that I have. I am not sure we appreciate our loved ones as much as we should. I know that I myself sometimes find that I will tell someone when they do wrong but I don’t tell them as often that they had done right. In the kitchen... there is a Crockpot with meat cooking for tomorrows beef barbeques. My loving husband started it for me after I read him my menu plan Monday list. How sweet of him. I went out into the kitchen and looked over to see it cooking already. Well that roast is still in the Crockpot this morning and it is falling apart and ready to be degreased. My husband put it in there frozen without trimming the fat which I do not think I have ever done but it worked fine. His “mistakes” have ended up working quite well on many occasions. I am wearing... bedtime clothes. Do you really want to know? Now I am wearing my husband’s socks that go almost up to my knees, Sponge bob pajama pants, an Aeropostle Hoody, and my wedding ring. I am creating... I have recently changed my blog around after many attempts to figure out how to make picture link buttons for the side I finally figured out how and made some in Microsoft word. I think I could do better but I was happy to have figured them out for now. I have some notes from reading through the bible that I want to start putting on my blog. With all the changes to my blog page I made a schedule so I will be trying to do a post for the day book every Tuesday, Menu on Monday and Bible study on Thursday after we read on Wednesdays. Friday is Financial Friday linkup and there is a homemaking linkup also on Wednesday. I thought if I scheduled my blog I would be more likely to take the time to blog. It is relaxing for me in between caring for the house and the kids. I am going... to sleep and I will finish this in the morning. I am going… nowhere today as the roads are getting icy. I was planning on going to Wal-Mart with my husband who has to go to secretary of state today but I do not want to take the babies out on the roads. I am wondering... if the kids teacher will make it here today with the roads being icy. I am reading... Oh my I am so ADHD. Or maybe I am multi tasking. I am reading quite a few books right now. I got a free copy of a book the other day from Tyndale that I do not have to review. They are trying out digital books, as right now they give hard copies to review. I am also reading to review and this for review which I will be giving away a copy when I am done on the 23rd of January . I am hoping... That it is ok to put those links to show the books as I do not have advertising on my page since I removed it all, but I like to use those book links so I can show what book or book I am talking about. 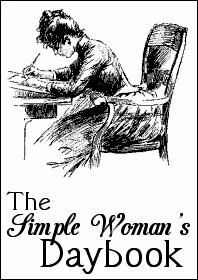 I am looking forward to... writing my simple woman’s day book weekly now that we are able to link up to our label. I am learning... a lot reading the New Testament and enjoying the experience with my family. Around the house... It is quiet the babies are playing next to me in the play room. My chair is by the door and I can watch them as I type. I am pondering... where we should go next in the house with organizing and de- cluttering. I took all the extra items out of the bathroom yesterday as I found it best to store them elsewhere. They end up being dug through by children and really do not need to be in there. It looks so much nicer though I don’t care for taking pictures as there is so much work to be done in this old house. How about some advice instead? Learn to appreciate what you have before it is gone or you are gone and that special someone did not know you cared. One of my favorite things... is when I am doing dishes and my husband comes up from behind me, hugs me and kisses me on the neck. A few plans for the rest of the week: Today, the teacher said she will be here even in the snow. Tomorrow we are reading Matthew chapter 11-15 with the family. Thursday is free so far. Friday is family game night if the kids get chores done well. Saturday lazy day and Sunday is church and Mr Nordin’s Memorial service at the school. I may gather the children from the nursery at church while they are singing the last song because we have to be to the memorial by 1, I believe and I am sure it will be packed. Church gets out at 12:30ish I noticed. A peek into my day...Up at 6:30ish got kids ready and off to school. Jim cooked breakfast sausage last night to microwave this morning. What a great idea he had. I made them some toast and they loved it. When the kids get home we are planning on having them do chores/homework and eat then playtime. Megan has to finish her science project tonight. oops this was where the photo was supposed to go!